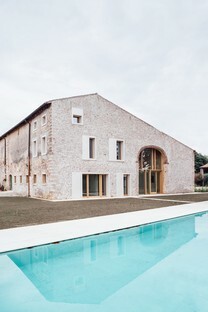 The young architects of Studio Wok have completed an interesting renovation project in a country home in Chievo, Verona. Studio Wok seeks traces of the building’s history to select and adapt for contemporary living in the renovated farmhouse. 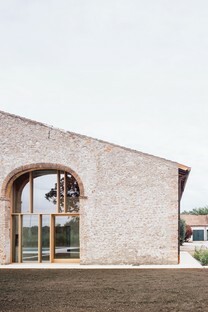 Studio Wok, a young Milanese architectural studio, has completed a type of project common in Italy, renovating an old farmhouse and converting the part used as a barn into an exclusive residence. Chievo is a town northwest of the city of Verona by the Adige River, where the countryside and the town come together and can no longer be clearly distinguished: the town’s urban fabric loosens to make room for small lots of cultivated land. The farmhouses that still dot the land in the Po Valley were originally inhabited by both people and animals. The stables and barns were not for animals only, but were close to the hearth of the home, in constant exchange with it. The kitchen and spaces for preparing meals existed in close connection with the spaces where animals ate and slept. This was the case of the home in Chievo, where a single building with two levels and an attic was inhabited by the family on the eastern side and by animals on the western side, where the stables were located, with no clear separation of these functions. The owners have now divided up the property, renovating the western side only, with the side garden and the courtyard in front. Formerly a secondary area for animals, this portion becomes the head and public face of the building in Studio Wok’s project. Its position on the court justifies this decision, considering that the site is a corner lot where three streets converge, and this façade of the building is the first we meet with, whether we come to the property from the north or the west. As it originally housed animals on the ground floor and stored hay on the upper level, this portion of the building had practically no windows, with the exception of two small openings in the northern wall. The western wall was “mute”, and in the ’50s the big brick arch providing access to farm equipment stored in the barn from that side of the building was bricked up to create an additional enclosure for bulls. To make this wall into a façade , Studio Wok decided to eliminate the added infill here and on the southern wall, and added doors and windows as required for the building’s new internal layout. 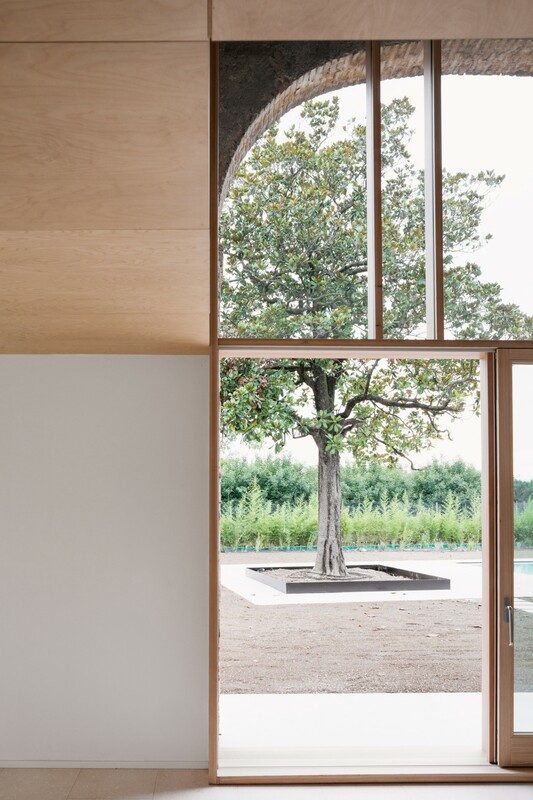 They paid special attention to the design of the windows and doors on the west and south sides, adding glass to open the house up to dialogue with its surroundings. 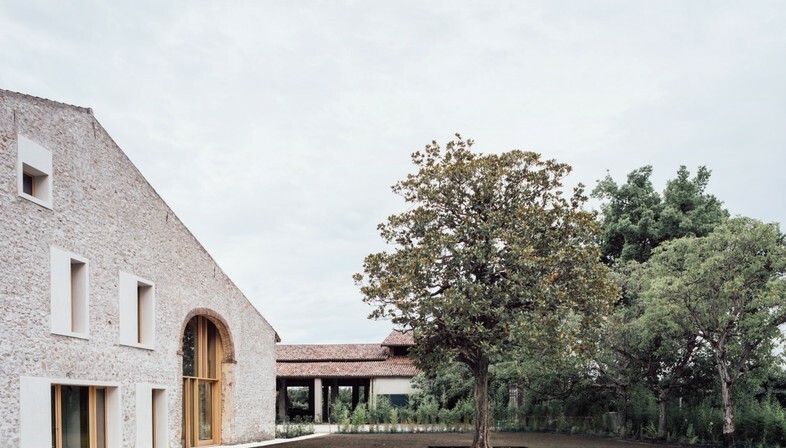 Interpreting a traditional element of rural architecture in the Veneto region in contemporary style, the windows are framed with biancone, a local stone from Lessinia, a part of the Veneto in the foothills of the Alps, with larch windows set back to reveal the thickness of the walls. The traditional walls made of wooden boards still found in barns in rural parts of the Po Valley inspire the frames with wooden crosspieces and uprights in the arch on the western side and the southern wall. 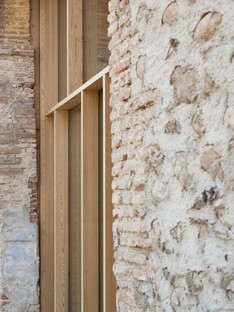 Thus the home maintains ties with local and traditional materials, using them in advanced new designs and applications. 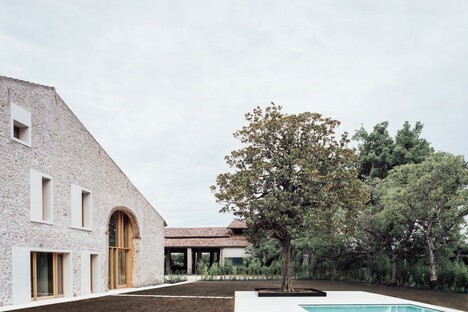 At the same time, the land in front of the house is landscaped to connect it with the new façade. The arch becomes the new entrance to the home, and the magnolia tree that already grew on the site becomes the focal point of the garden. A relationship is established between these two vertical elements standing across from each other in the form of a stone pathway. When the plaster was removed from the main façade, the brick and river gravel of the building’s weight-bearing walls was revealed, while the floor slabs inside were completely demolished and rebuilt on the basis of the new spatial design. Beyond the threshold of the big glassed-in arch is a living room exploiting the full height of the building, onto which the little internal windows of the rooms on the upper level open. In Studio Wok’s new floorplan, the ground floor contains the living area, including the dining room, the kitchen, and a library with a little fireplace. The two upper levels contain the sleeping area, as is traditional, in this case three bedrooms and two bathrooms. 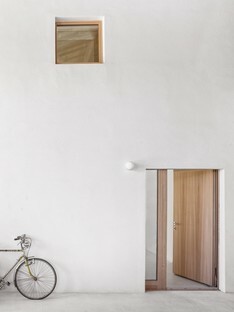 The empty space in the centre, which forms the core of the home, has been completely covered with multi-layered birch wood, so that, according to the architects, the upper floor looks like “a wooden volume hanging from the ceiling”, clearly revealing how the interior of the building has been emptied out and replaced with a new layout. 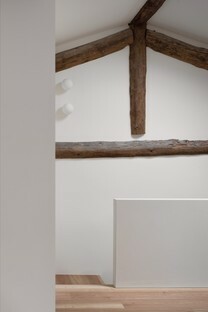 Used as a finish in all the rooms in the home, the wood that was in the past left unfinished and identified the humblest parts of the home, the stables, barn and farm equipment storage space, now adds nobility to the project. 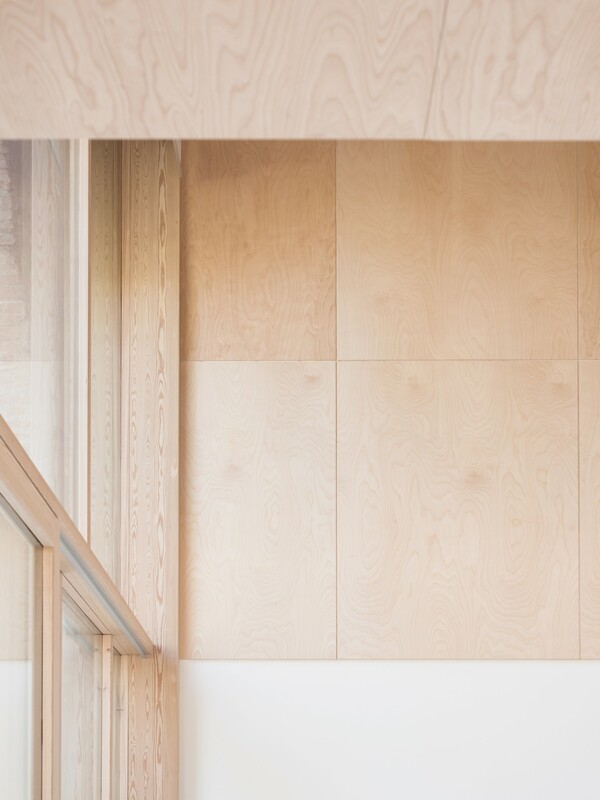 In this project multi-layered wood creates a feeling of domesticity without imitating the past and a traditional lifestyle that has nothing to do with the way the house is lived in today.